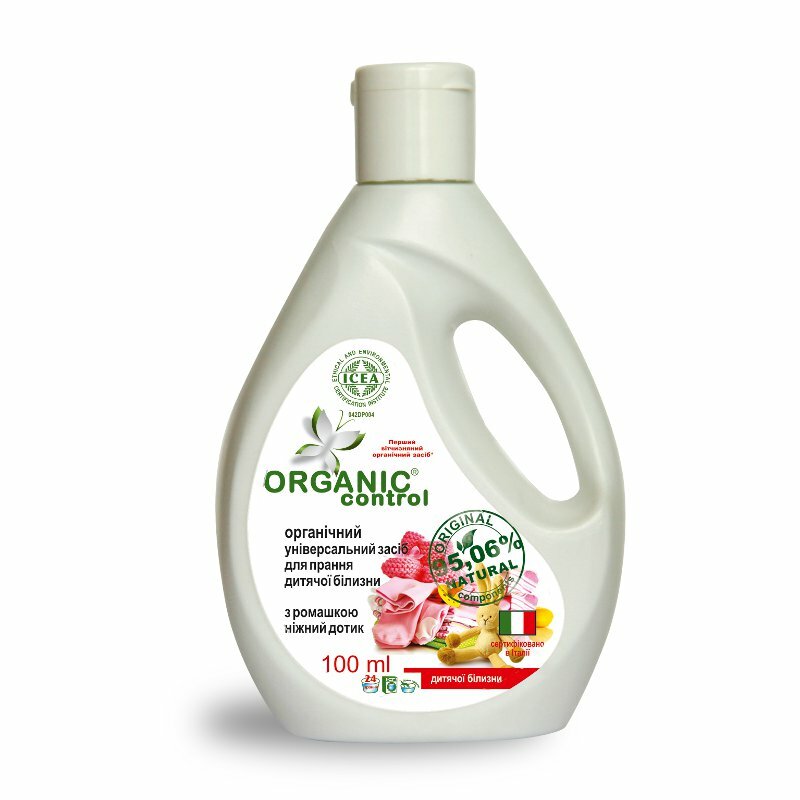 Organic Baby Laundry Detergent is produced by the Ukrainian brand Organic Control. This phosphate-free product enriched with chamomile extract is specifically designed to wash baby clothes. It does not cause skin irritation and is suitable for newborns. Chamomile extract contained in the detergent has soothing, anti-inflammatory and antibacterial properties. The product is ICEA certified (042DP004) which confirms that it is made with natural ingredients and safe for your health and the environment. It is free of harmful and dangerous ingredients such as phosphates, borates, formaldehyde, chlorine, synthetic colourants and fragrances, EDTA, SLES, parabens. The detergent contains 95,06% natural origin ingredients. This Organic Control baby laundry detergent easily copes with all kinds of dirt including fruit juice stains, baby formula stains and old stains. It helps to prevent premature wear and tear, keeps colour from fading and prevents white clothes from greying. The product is effective even in cold (30°С) and hard water. It contains ingredients which prevent the formation of scale on the heating elements of the washing machine. The detergent is easily washed out. It is biodegradable and thus does not harm the environment. Directions. Suitable for hand and machine washing. Presoaking: 45 ml per 5 L water (30-40°С). Hand washing: 70 ml per 5 L water (up to 50°С). Machine washing: 110-190 ml per 5 kg laundry (30-95°С). In case of tough or old stains, increase the dosage. For a better effect, apply a small amount of detergent onto stains and leave for 20-30 minutes, then wash as usual. Ingredients. Aqua, Sodium Myreth Sulphate*, Potassium Oleate**, Glycereth-2 Cocoate*, Glycereth-7 Cocoate*, Organic Glycerin**, Cocamidopropyl Betaine*, Propylene Glycol, Vinylpyrrilidone/Vinylimidazole copolymer, Tetrasodium Glutamate Diacetate*, Modified Polycarboxylate, Alpha-Amylase, Pectate Lyase, Methylchloroisothiazolinone, Methylisothiazolinone, Magnesium Chloride, Magnesium Nitrate, Chamomila Recutita (Matricaria) Flower Extract*, Sodium Chloride, Sorbitan Caprylate*, Citric Acid. Want to buy Organic Baby Laundry Detergent? Call us or submit your order via our web site!